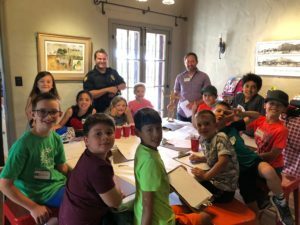 City of Phoenix Police Officer Jared Sherman stopped by the Shemer Art Center during Week One of Summer Camp…. no, not specifically to check on our campers. But while he was here he just happened to take the time to greet each class and pose for a picture with Mr. Travis’s drawing class! Thank you Officer Sherman for all you do for Arcadia! We had a great group of campers for Week One, ranging in age from 6-13, with many returning campers from last year, and many who are also signed up for another week this year! Here’s to our Week One 2018 Summer Campers!